The man in the crowd is a wonderer with relaxed habits. In him the course of things and movement of the city is reproduced. The Düsseldorfer Detlef Weinrich is such a man in the crows. Some one who is constantly listening to future winds through rushes of the past. He loves the night for its free will. And his music tells stories about it. You might know him as a member of the band Kreidler. As a solo artist he goes under the name Tolouse Low Trax. And he’s already got three Eps and two albums under his belt. His first solo album „Mask Talk“ thrives on a feathery beat frequency and cool new-wave-strength. His recently released piece „Corridor Plateau“, which appeared as a limited edition to accompany the exhibition „Corridor Plateau“ contains percussive electronics and Industrial sounding like its from the second industrial revolution. His third album „Jeidem Fall“, is also not from here. It sounds like music brought down to earth from the heavens. But its a dark cosmos in which there are only fleeting glimpses of light. All eight tracks were composed in a short space of time over the period of just a few months and fit together perfectly atmospherically. With a musical expressiveness that undoubtedly twists your emotions, „Jeidem Fall“ attacks the subconscious and clouds the mind. The drums have more movement that on „Mask Talk“. Along with the constant tapping of drumsticks goes melodical arpeggios dancing dark and dirty. At times longing vocals drift abstractly through the room, as on „Sa Seline“ or „Geo Scan“, without telling any obvious story. 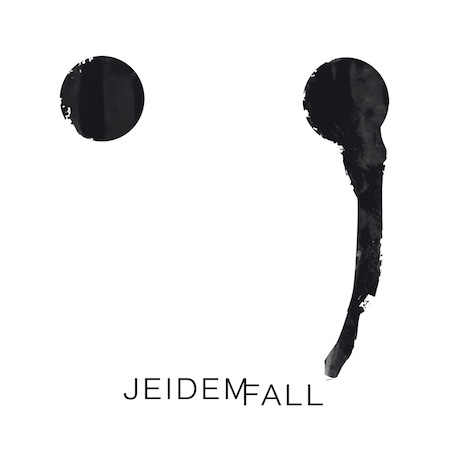 To sound like stylistic cross references from the present and past is all just speculation for nothing on „Jeidem Fall“ really sounds like anything that has gone before. You could compare the dark minimal timbre of the drum computer aesthetic with Craig Leon’s first reductive album „Nommos“. There is also a hint of the minimallist industrial of the Spanish band Esplendor Geometrico in the bubbly textures. But Tolouse Low Trax is still looking from the present into the future and filter and filters all his personal preferences through his MPC and his small synth setup to make them come alive here and now in a new way. Again Tolouse Low Trax has created a truly mysteriously vibrating drum computer music which offers hypnotic magic for the shadowy dance floor. Only a little light should illuminate the whole thing and the bodies that move above them should have no fear from threatening percussion which are displaced into a misty trance. A dark swaying shadowy mass, ideal for a journey at the end of the night and all those non-places where longing sleeps and the last romantics dance while getting drunk.